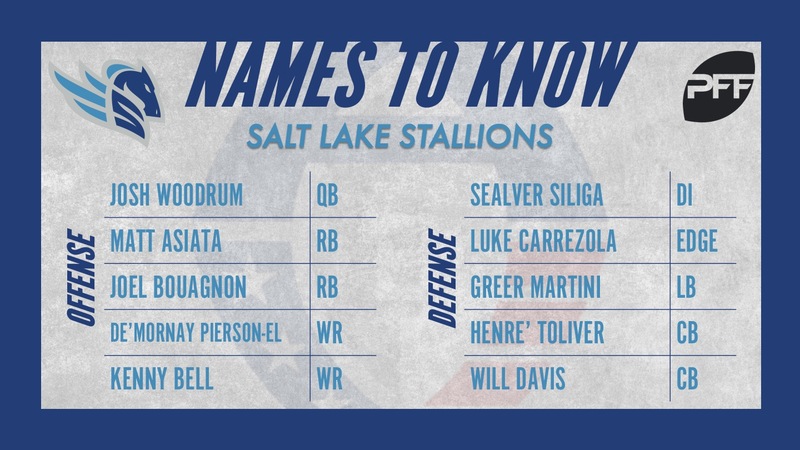 We continue the list today with the Salt Lake Stallions, head coached by Dennis Erickson. In camp with the Baltimore Ravens just last August, Woodrum got the chance to play behind two Heisman Trophy winners and a Super Bowl Champion in the QB trio of Joe Flacco, Lamar Jackson and Robert Griffin III. While he didn’t stick in the crowded QB room that was Baltimore, Woodrum’s game grades over his preseason course of action as well as his grades from his time before Liberty was an FBS program really stand out. He’s put out plus-grades in all but one game that we’ve recorded of his and dominated in the AAF’s scrimmages, churning out the fourth-highest passing grade of 83.7 during the opening slate of exhibition action. In that game, he connected on all four of his pass attempts from a clean pocket and moved the chain twice, averaging 22.8 yards per attempt on the very limited sample size. A very well-known name around the NFL, Asiata was a solid back for the Minnesota Vikings from 2012-2016. While he never really added much by way of a receiving weapon at the NFL level, Asiata still produced a career average of 2.12 yards after contact PER carry. He’s a load to bring down and a real threat inside the red zone at 5-foot-11, 230 pounds. This is a name certainly not as well known as his teammate but that certainly isn’t Bouagnon’s fault. The stud from Northern Illinois dominated over the three years of college grades we have for him, totaling 2,817 rushing yards, 1,595 of which he generated after contact. He broke 69 missed tackles on his 575 attempts during that span and scored a whopping 31 touchdowns. Unlike Asiata, he’s a threat out of the backfield as well as he caught at least 13 passes a season from 2014 to 2016 and gained more yards after the catch than total receiving yards. He’s a total threat in the backfield for the Stallions, and more than worthy of a horse pun here. Giddy up Bouagnon, it’s time to ride. We have all four years of Pierson-El’s Nebraska career at our fingertips, a strong career when considered next to the down years of Cornhusker football during his time. His final season saw a breakout year in 2017, hauling in career-highs for yards, receptions, touchdowns, yards after the catch and forcing a massive 13 missed tackles forced on 45 receptions. His slight frame is likely what kept him from sticking with an NFL team but if he can line up and produce over the middle of the field from the slot as he did in 2017, he’ll be fun to watch. Bell enters the WR room also hailing from Nebraska, just a few years ahead of Pierson-El. Like his fellow Cornhusker, Bell broke out in his final season, to the tune of 47 receptions for 792 yards that included 301 after the catch. He broke nine tackles after the catch and was selected by the Tampa Bay Buccaneers in the fifth round of the 2015 NFL Draft. While he hauled in just two receptions for the Bucs over two preseasons, Bell’s quicks earn him a spot not only on the Stallions final roster but on our names to watch as he’s as fast as anyone on the field. Producing as a pass-rusher during two of his seasons with the New England Patriots from 2013-2014, Siliga saw his way out of the NFL in 2017 after a stint with the Bucs. For his career, he recorded 32 total QB pressures that included five sacks and three QB hits. He was a decent tackler at the NFL level and his experience and big frame can go a long way of anchoring the Stallions defensive front. Carrezola flew all over the field for Connecticut as he produced as a pass-rusher and a stout run defender. He transitioned to more of just a pass-rush specialist in his final season with the Huskies as he generated 33 total QB pressures on his 437 pass-rushes in 2017. He may not have spent time with any NFL team in 2018 but his sack in the exhibition contest against Memphis was one of the highlights of the game and he finished with the fourth-highest defensive grade. Speaking of flying around the field, Martini did just that during his time at Notre Dame, recording 160 total tackles from 2014 to 2017. He struggled with misses throughout his career but adds value to Salt Lake with a full range of skills necessary for an off-ball linebacker. Over his three years as a starting cornerback for Arkansas, Toliver improved his grade each year. He capped his tenure with the Razorbacks with a career-high 78.1 overall grade in which he intercepted three passes and broke up eight more. He was no stranger to sticking it against the run either as he earned plus-grades in run defense in his final two seasons. Toliver actually had some impressive moments with the Indianapolis Colts this past preseason, allowing just 38 yards on nine targeted passes. His quicks and decent size for the position could make him more than just a name to watch. A third-round pick back in the 2013 NFL Draft, Davis has looked like his old self and more with the Stallions. The former Utah State cornerback seemingly hasn’t lost a step and should help anchor a young secondary. In his time with the Miami Dolphins and San Francisco 49ers, Davis allowed a catch rate of just 54.3% on 46 career targets and allowed a reception longer than 29 yards just once.